Remember my Rosé-Soaked Roasted Strawberries from my last post? 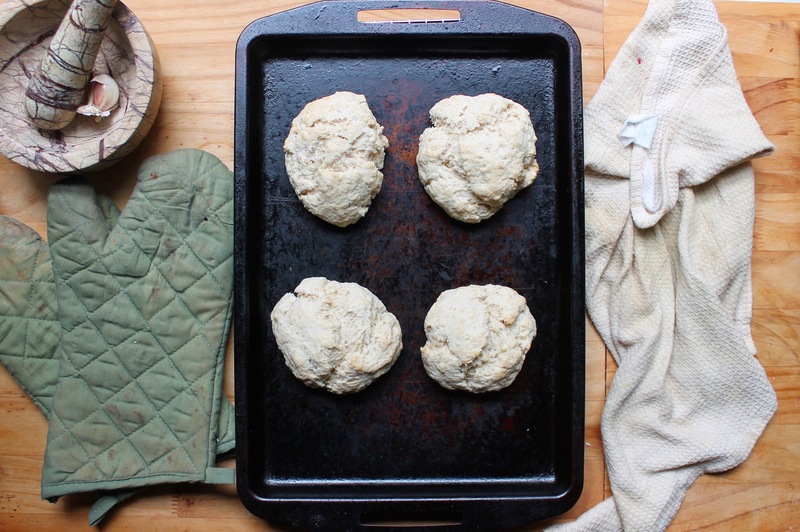 Well, they certainly pair well with these Buttermilk Biscuits! On Saturday, I’ll combine them into one final recipe (…oh…wow…what could that be? ), along with a simple whipped cream recipe to really bring all of these elements together. Prior to this, I had never really made biscuits. Prior to making them, I had a similar apprehension akin to the first time I made scones: for reasons I can’t truly comprehend in hindsight, I was nervous to make them. The recipes I had heard or read seemed a little too involved, and I was paranoid about not making them the correct consistency. Some people love a dry crumbly scone, while others love a moist scone. Like that, I was worried that I’d make a dry and / or tough biscuit. My fears were allayed once all was said and done. 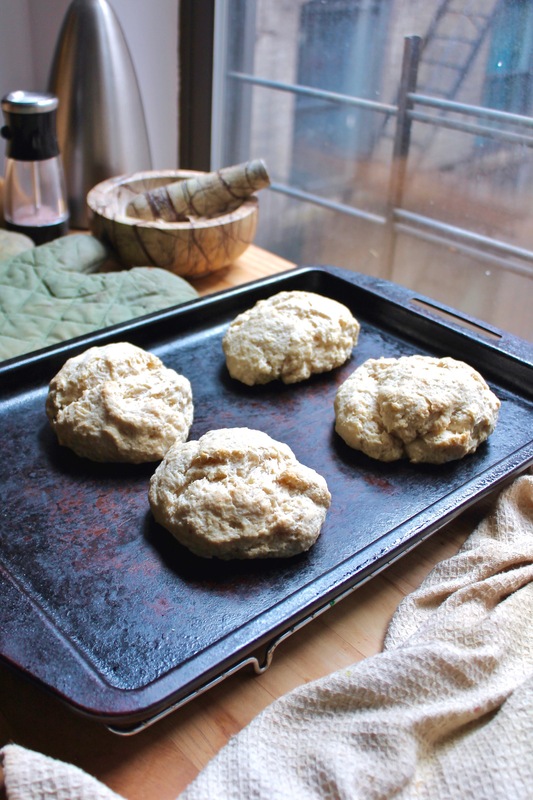 I will absolutely thank Bon Appétit – via Epicurious – for their Buttermilk Recipe from April 1998, which I followed to almost a complete T.
I ended up with some biscuits that had the proper balance of moisture and crumble. The subtle saltiness satisfied my craving for something savory, but they still work well with fruit and whipped cream. – If you are going to use the milk + acid way to make “buttermilk”, such as I did, add the acid to the milk and let sit for 5 – 10 minutes before using. Do not stir! Why do I make “buttermilk” this way? I’m too damn frugal to buy a container of actual buttermilk and have leftovers. Haaa. 2.) Sift flour, sugar, baking powder and salt into a large bowl. Add butter and rub into dry mixture with fingertips; the final mixture should look pebbly or like a fine meal. 3.) Slowly add in milk with acid or buttermilk and stir gentle to combine; the batter will not necessarily look uniform at this point, but make sure the dough that is forming is uniformly moist. Once combined, use hands to gather and shape dough into a large ball. 4.) Divide dough into four pieces, approximately 3″ in diameter, and place on an ungreased baking sheet, spaced evenly apart; roughly 2″ between each biscuit will be fine. 5.) Bake biscuits for 20 – 25 minutes; biscuits will be pale and not golden or brown. Remove from oven and allow to cool on rack for 30 minutes. Eat immediately; if not eating immediately, individually wrap each biscuit in plastic wrap or place in an airtight container. Biscuits should stay fresh for up to 5 days.